FTP伺服器架站軟體 - 雷電FTPD是一套非常容易設定的FTP伺服器端軟體,即使是從未有FTP Server架站經驗的網友,也能在短時間內架好您的FTP Server,它的安裝雖簡單,功能可一點也不陽春,雷電FTP伺服器除了具備了標準FTP Server的所有功能之外,還提供了種種先進的實用機能,例如TLS 1.2安全連線、UPnP NAT穿透、UTF8萬國字元、MODE-Z即時壓縮、VMP虛擬磁碟陣列、VLS虛擬伺服器連結、遠端遙控、虛擬IP架站等等先進又實用的功能. 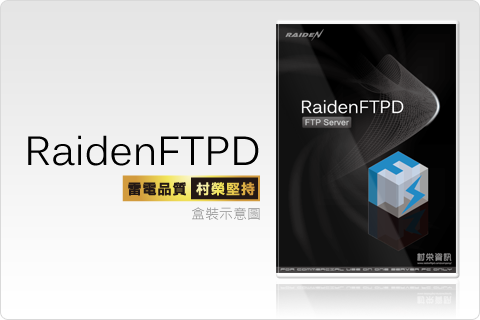 Copyright © http://www.raidenftpd.com/ 2000-2019 all rights reserved. The copyrighted works contained in this information service shall not be copied, reproduced, varied, altered, modified, adapted, distributed, performed and displayed in any form without the written permission of the copyright owner. All trademarks belong to their respective owners.